Now I’m “home,” which has never felt less like home. Of course we love seeing our friends and family. But it’s different here in the United States of America. It’s weird to drive without being honked at. It’s weird to be crossing the local bridge, slow down to switch lanes–and have the driver in the next lane slow down even more so I can get over. It’s weird to have so many choices in every grocery, drug, and convenience store, in every aisle, for every product. Somebody came up with new stuff while we were gone. New ice cream flavors, new and improved drinks, heck, I got to try four kinds of cherries I’d never heard of before. We live in a place where people are desperately poor. When you’re used to keeping an eye on everything so it doesn’t get stolen–and failing, as a lot still disappears–it’s weird to see people set their belongings down, knowing those items will still be there when they return. I went with my daughter to see a comedian in the Performing Arts Center and someone there saved a seat with a purse: no one around and a purse sitting on a chair, unwatched, unguarded. That’s a bizarre sight to us now. Saying “hi” to people on the sidewalk or in a store here gets a range of responses from greetings to shrugs to scowls to looking the other way. I’m used to saying “adios” or “buenos” to a whole lot of people when I walk in Managua. I get a 90%+ response rate there. That doesn’t work as well here…unless I’m hiking. When we hike, we all say “hi.” Hikers will greet one another with a smile. Hikers on the trail are like Nicaraguans on the street. People are busier, time is counted more carefully, and there’s less stopping to talk here in the U.S.. In Nicaragua, even if you are working, if someone you know comes by, you will take time to have a conversation. Not a 30-second “Howareya?gottago,” but a real interaction. Not in every store, but in pharmacies, auto shops, certainly any small, non-chain business. You just don’t do that here with people who are working. You might chat with your friend while she’s at work, but probably for less than two minutes. Five max. Money is just crazy here. It’s hard to grasp how much of it there is floating around. I know I can’t convince anyone, but it feels worth it to try, so here goes: If you live in the U.S., you are rich. * You might feel poor because of the wealth that surrounds you and all the voices clamoring for what you have, but trust me, you’re wealthy. There is so much to spend money on and so many people freely spending it. I can’t quite figure out how to feel about it, honestly. We live ten to eleven months of our year next to people who consider $5 a lot of money. We hire one neighbor to do a little work, around an hour a day, which is a mutually beneficial situation. Symbiotic, even. She would like to have us wait and pay her at the end of the month, so she could get a larger sum that she can save up…but every week, something has happened and she needs the money now. And I’m certain they earn more than $2 per day, which means they make more than the average Nicaraguans. When you live on so little, there is no margin. It’s hard, therefore, when I’m hearing about how the economy is doing so poorly here. Not that people’s crises aren’t real; of course they are. But after five years in the second poorest country in the Western Hemisphere, our measures have changed so much. Even though on one level coming back here and spending $20 or $30 at the Farmer’s Market feels normal, it can also feel like vertigo when we try to adjust. That’s exactly what I mean by “weird”: it’s both a “normal” behavior for me and causing severe dissonance. Simultaneously. I think the single hardest thing for me about living in Nicaragua, and the thing which makes it both a relief and difficult to visit the U.S., is that things work here. You might not think they do. And again, I know this isn’t a reflection of everyone’s life here. But roads are smooth, people obey traffic laws, when you pay a bill it’s paid, if you get a ticket you just mail in your fine, and people wait their turn in line. You might be able to site an example when this wasn’t true and it probably pissed you off–but that’s because it was an exception! When that guy jumped the line and pushed his way straight to the counter, everyone else probably glared and grumbled about it. But I live in a culture where waiting passively behind others until your turn comes up is frequently not how it’s done. 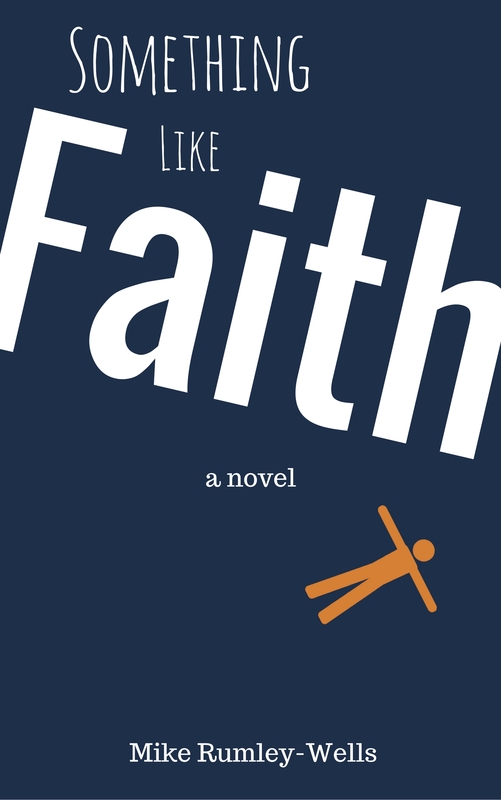 If you walk into a place of business, there might be a line to the counter, but there also might be a crush of people six wide and sixteen deep, and you jockey and elbow until you get a turn–or you never get to the front. I know that sounds rude. It feels rude to me. But waiting in line politely is a luxury practiced by people who know they’ve got enough. If your life is a constant struggle with scarce resources and you’ve experienced going to bed hungry or sending your children to bed hungry, pushing for what you need may make more sense than letting others step in front of you. Yet there is a flip side to this, too. 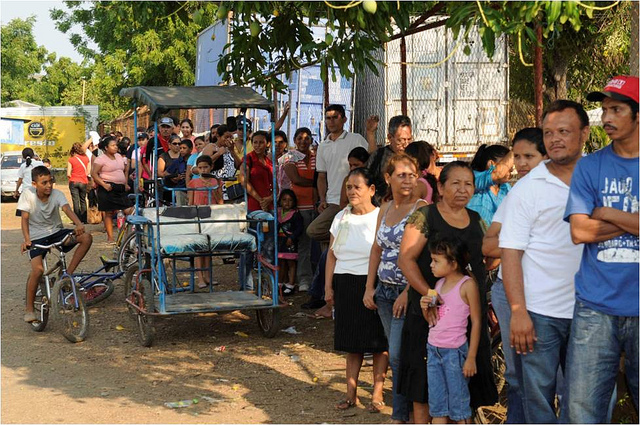 Nicaraguans can wait for hours in lines when U.S. folks would be making a fuss within minutes. I know that sounds contradictory, but it’s true. 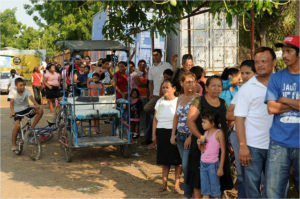 The day the Sandinistas were giving away food baskets near our barrio, hundreds were standing in line in the sun and humidity (did I mention it’s warm there?) for three to four hours. To get rice and beans and sugar and oil. You probably don’t need rice and beans and sugar and oil that much. Neither do I. I was raised in a culture in which waiting for a long time was bad. Yes, we take our turns, but standing and waiting for longer than fifteen minutes for anything less than a cool concert or a great rollercoaster felt like an affront. And I’ve never gone to bed hungry, except by choice. Why are some line situations survival of the fittest while others are endured patiently? I don’t know. I may not yet understand Nicaraguan culture well enough to see. One summer when we were back vi siting, we went to the Brookfield Zoo in Chicago with my sisters. 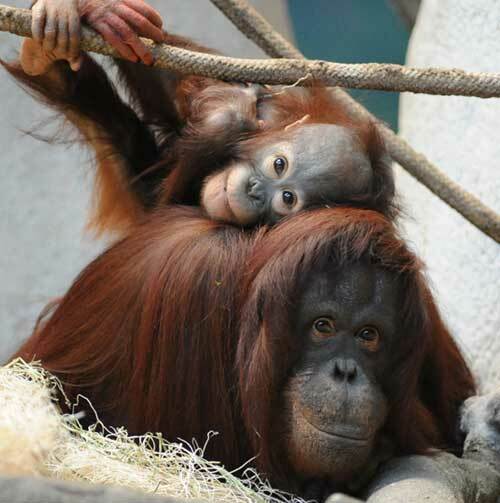 The kids and I visited the primate habitat. It’s huge and has lots of steps so you can see the apes and orangutans and gorillas from different perspectives. We were zipping up and down those steps, excited to see the animals, when we noticed that people around us were having trouble. The folks walking in front of us were sweating profusely, soaking their shirts. My daughter and I made an uncharitable comment about their fitness level. Then we noticed that several other people were also panting, dripping sweat, stopping to recover. Finally it occurred to us: it’s humid in here! We literally hadn’t noticed. We were acclimated to the tropics, and this exhibit was designed to simulate the tropics. Our bodies didn’t react because it felt normal to us. All the weirdness I’m describing isn’t weird, of course. But that primate exhibit wasn’t particularly humid, either…to a gorilla. Or us. That primate exhibit wasn’t particularly humid, either…to a gorilla. Or us. Having said that, I’m not one who subscribes wholesale to cultural relativism, either. It’s not “all good,” just because “it’s the culture.” Female circumcision is a crime and a butchery wherever it’s practiced. 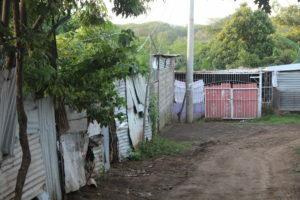 They do some horrible things in Nicaragua and we do some horrible things in the U.S. It may be easier to see when you’re looking from the outside, though it feels more offensive to call it out. Maybe that’s why I’m feeling so weird this time around: I don’t know if I’m an outsider looking in or an insider looking out. Am I the faithful opposition offering a just critique, or a mouthy visitor, an ugly American turning his judgment on his own country (kind of an impressive accomplishment, that). I feel in between. A good friend warned me, about a year after we’d moved to Nicaragua, that I had joined the class of people who no longer feel fully at home in any one place, but have their hearts divided and can move between cultures. Yes, we can move back and forth between cultures, successfully if not seamlessly. I sincerely hope we’re making a positive difference. But not, I’m learning, without a cost. * I know that people suffer poverty in the U.S. as well, but it’s on a different scale. If you earn $8,000-$10,000 in a year in the U.S., you are poor. But many people live on $1-$2 dollars a day–as many as 75% by some estimates–and that looks like something else entirely. Hey Mike, living 2 years in Bogota doesn’t quite compare to your experience but I can identify with everything you’ve mentioned. Thanks for putting my feelings into words, especially at this very moment because I’m literally on my way home from a 10 day mission trip to Bogota and all this is really fresh in my mind and soul, God bless you, brother, and your family, too, as you enjoy the “good” of the USA. Thanks, Kelly. You were definitely there long enough to feel all this conflict and vertigo and I’m glad you could relate. You’ve come through (or are coming through) the transition back that is still ahead for us. We’ll be asking lots of questions when that time comes. Great post, Mike. My analytical side finds the economics if this fascinating, and I’m always curious to understand the causal relationships behind such disparities. Obviously your experience has drastically affected you & the RW family; next, how can/is your mutual understanding of both worlds be best used to impact Nicas in a practical sense? Then to further complicate it with the idea that what often matters to humans of any culture, does not align with what matters to God. Shalom! Thanks, Justin. I love that you’re asking the big questions, as always. It would be great to talk about what I’ve learned and give you more material to analyze. Some day. I do think this process is helping us be more effective there. Here? We’ll see. As you say, it’s very complicated when we consider God’s values vs. cultural values, and even more complicated when we try to connect through people’s values while pointing to what matters to God. And all that is assuming that we’re getting those values right! Miss you, Justin. Keep changing the world. Thank you so much for taking the time to write this. John LaPointe goes to Nicaragua every year for about two weeks, and we talk often about staying long once I no longer work full-time. When we first started talking about it, that seemed so many years away; now only a few years. I’m excited and apprehensive about this. I think it’s reasonable to be both excited and apprehensive! It’s exciting to hear you’re thinking in that direction. I think there’s a number of things you can do to prepare…and after that, you simply have to live it. Thanks for the encouragement! Keep the comments coming, and I’d like to hear more as you get closer to your transition.